6) and probably causes or leads into Mitocrondrial dysfunction - "Mitochondrial diseases result from failures of the mitochondria, specialized compartments present in every cell of the body (except red blood cells). 9) seizures, strokes, severe developmental delays, inability to walk, talk, see, and digest food combined with a host of other complications. If three or more organ systems are involved, mitochondrial disease should be suspected. 13) Here is some more great info from ACMI. "You have a pretty comprehensive list of wireless health impacts and some of their causes, but you could perhaps expand that a little bit. A more specific study found RFR exposure activates voltage-gated calcium channels. 14) This leads to increased calcium levels within cells, which leads to the production of peroxynitrite. Peroxynitrite is at the root of most inflammatory diseases, including neurodegenerative and cardiovascular diseases, migraines, and allergies." 17) to DNA (causing loss of fertility and increased risk of cancer), and digestive enzymes from lysosomes. Membrane leakage can also open the blood-brain barrier and other protective barriers, leading to Alzheimer’s, dementia, asthma, allergies, and various autoimmune disorders." 22) substances called crytochromes which are protein pigments found in almost all plants, bacteria and animals. They measure light which controls and resets their biological clocks. It also allows animals to navigate by being able to see the Earths natural magnetic fields. 23) RFR can interfere with the perception of the earths magnetic field. It can cause Birds or Insects to navigate in the wrong direction. Birds typically will not stay in comm tower areas due to this. RFR can also disrupt the internal clock based on the suns position. S19 makes it exempt from health safety and environmental reviews. congress.gov/bill/115th-con… Also s-88 is the digit act and it looks at barriers to rolling out these transmitters (remember Ohio) basically placing them where ever the hell they want. But what scares me is they say that IF BEEs cannot navigate then crops will not be pollinated so basically the end of crops and possible civilization. This is what Scientists are saying not me. And that whole ionized and non-ionized crap don't fly here. Now how about more..
@40_head I am astonished at the different directions I can go with this and did get off track a bit. Richard Allen is a thread on its own. 5g++ military grade weapons are as well. The millions that big wireless are paying to cover or bury 5g negative studies it is like a tunnel with..
patents that were associated with 5G. U.S. President Donald Trump has blocked microchip maker Broadcom Ltd’s (AVGO.O) $117 billion takeover of rival Qualcomm (QCOM.O) amid concerns that it would give China the upper hand in the next generation of mobile communications, or 5G. Would someone be willing to murder someone that holds a patent on 5G The top patent holders Samsung, Qualcomm, LG, Huawei* and Intel control over 13,300 patents But remember the chips are where the chips are. Look at what I found. Do you remember a plane that no one could find? Registering one-off domain names for political purposes is straight out of the Hamish Marshall/Ezra Levant/Rebel Media playbook. So now we know who's running that show. As a random example, let's see where the URL ashleycsanady.com takes us. Do you know if a woman gets pregnant again earlier than one year after her last child, it increases risk for giving birth to an underweight, small-for-age baby and a baby born prematurely? All these can make the baby catch infections easily which may kill the baby. Infact, depending on how early it is, and what kind of delivery the woman had previously, having another pregnancy quickly can be very risky and seriously put the woman’s life in danger. Some women can even have a stillbirth- a baby (usually after 7 months) born dead on arrival. So this is a serious matter. InterPregnancy Interval (also called Pregnancy Spacing) is quite an important thing for you to know as a man or a woman- if you already have a child or plan to have someday. It refers to the duration that should be between one pregnancy and next. 1) It’s all coming together now. 3) Internet commenters take "FLYEAGLESFLY" to be a message from Lynn de Rothschild to Bill Clinton. Using his Secret Service code name, "Eagle." 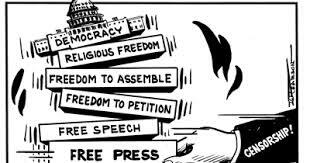 Why is the free press valuable in a democracy? Does the press give us what we need as citizens? What can we do to be good news consumers?